it has several .js files to include - how does one include .js files in an appStudio project? 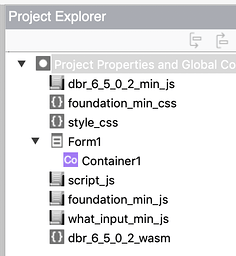 it has several .css files to include - how does one include .js files in an appStudio project? it has script calls at the end of the HTML page - can these just go in the code behind, perhaps on an .onshow() event for the form? I expect I could put the HTML in the ‘body’ in an HTMLview.inner view - is that true? For 1 and 2, put the files in the project’s home directly. Then drag and drop them into the Project Explorer. Put this this code into function Main(), which gets called after everything is loaded. Great help. I did the following. Made a Main() function that holds the JS that was at the end of the original HTML (for startup). Put the three .js and two .css files in the project folder and in the Project Explorer. Used a Container control and put the HTML in the Content property. won’t run, either locally or on Volt. When asked to run, it just doesn’t do anything visible. Any thoughts? I had a look at your project. Once of the third party css files you were adding had a bad character in it. We have just uploaded a new build (7.3.1.3) which handles this gracefully. Thanks. I couldn’t get it to run in appStudio (got it to run in a plain browser with HTML). I’m just not familiar enough with how to make something in HTML transfer into an appStudio app. Thanks anyways George. Give me a bit more detail - it’s usually pretty straightforward to do this. Opening the Chrome Console, I see errors, like “Uncaught ReferenceError: dynamsoft is not defined”. First job is to fix that error. I see dynamsoft is called from foundation.min.js. It looks like you’re missing a .js file to define dynamsoft. The next step for you will be to figure out what file you need for dynamsoft and add that to your project. Just remove them. AppStudio will add them automatically. It does so with all the files dragged and dropped to the Project Explorer. Took care of the HTML problem by removing the lines - thanks! The second problem was that the program is not finding the dynamsoft object. This object appears to be defined in the dbr_6_5_0_2_min_js file on line 16 (at the end). Thoughts? Here is a link to the original and current version of the app. Once you make that change, you’ll find dynamsoft is still not defined. What library supported to define it? 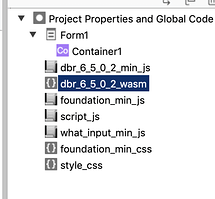 A second issue that this is the first time someone has used an .wasm file with AppStudio. Is there a non-wasm way to do this? I don’t know of a non-wasm way to do this. 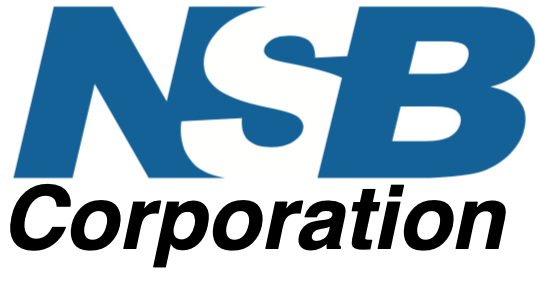 The dynamsoft object appears to be defined in the dbr_6_5_0_2_min_js file on the end of line 16 (var dynamsoft). If you look in the original zipped file from the dynamsoft folks, this is all of the code to make it work. I used their code and made it work in a browser with simple HTML demo webpage they included. Do you think appStudio won’t work with a wasm file? You were right to move the file up. The problem was that script.js was executing before the dbr module had run. The order is important. Delete the file from the Project Explorer. Drag the file back into the project folder. Add the file name to ‘manifest’ in project properties. You may need something in extraheaders as well - wasm files are still new to AppStudio. Time to give up? I suspect the .wasm is the issue now… and I know nothing about wasm. Would a temp. fix be to run it off a web server in a container as an iframe perhaps? 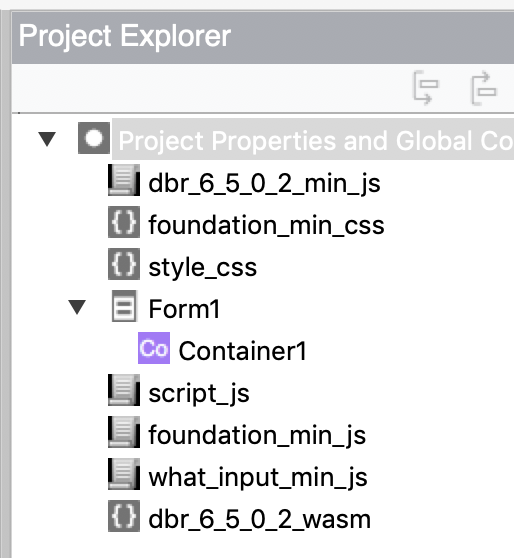 // By default, js will load `dbr-<version>.min.js` & `dbr-<version>.wasm` in the same folder as the context. 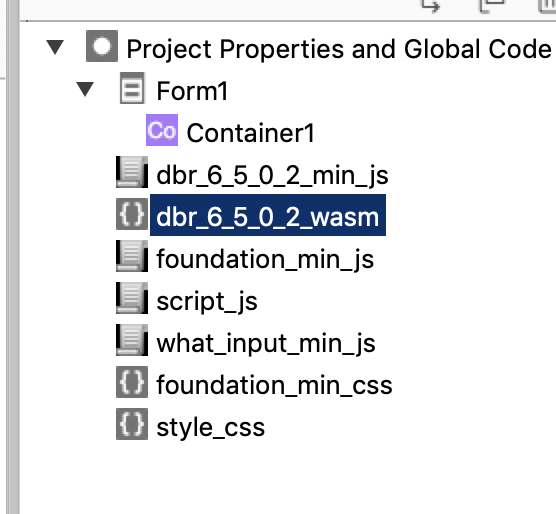 // `dbr-<version>.min.js` & `dbr-<version>.wasm` should always put in same folder. // Modify this setting when you put `dbr-<version>.min.js` & `dbr-<version>.wasm` somewhere else. Since the .wasm file is now in the same folder as the corresponding .js file, you don’t need to change the path to it. Just comment line 10 out.